Israeli soldiers attacked, Friday, the Great Return March processions, along the eastern border areas of the besieged Gaza Strip, wounding at least five Palestinians, and causing dozens to suffer the effects of teargas inhalation. Media sources in Gaza said the soldiers fired dozens of live rounds and high-velocity gas bombs at the protesters. Medical sources at the Shifa Hospital, west of Gaza city, said the soldiers shot two young men with live rounds in their legs, east of the Zeitoun neighborhood, east of the city. They added that the two Palestinians suffered moderate wounds, while dozens were treated for the effects of teargas inhalation. The soldiers also attacked dozens of Palestinians east of Khuza’a town, east of the southern Gaza Strip city of Khan Younis, wounding two with live fire, and causing dozens to suffer the effects of teargas inhalation. 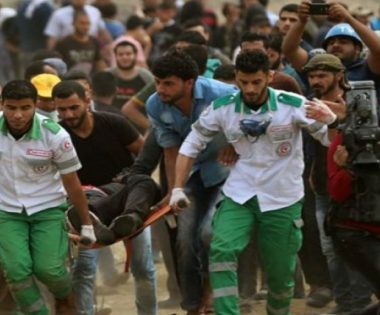 The Health Ministry in Gaza said the soldiers also shot a young man with live fire in Abu Safiyya area, east of Jabalia, in northern Gaza, before he was rushed to the Indonesian Hospital in nearby Beit Lahia, suffering moderate wounds. It added that dozens of Palestinians suffered the effects of teargas inhalation east of the al-Boreij refugee camp, in central Gaza, and east of Rafah, in the southern part of the coastal region. It is worth mentioning that many protesters burnt tires and flew balloons carrying the colors of the Palestinian flag. On Thursday afternoon, Israeli soldiers fired a missile at Palestinians east of Rafah, in the southern part of the Gaza Strip, killing one, identified as Abdul-Karim Radwan, 22, and wounding three others, including one who suffered serious injuries. Following his death, the Al-Qassam Brigades, the armed wing of Hamas, issued a statement vowing retaliation.